For the younger among us, this must have seemed a long, strange winter. By golly, it’s was cold from November to March, and rain levels haven’t hit this deep, hard, or frequently in a generation – or two. The coldest February in 60 years in Los Angeles happened this year. Which means, most Angelenos have never experienced such a thing as what just happened. Altogether, this sudden change in weather has the Great State of California breathing a very welcome sigh of relief from decades of dry to severe drought years. Time Ranger John Boston and I are both old enough to remember back when we were kids, Southern California weather was just plain different than what kids experience today. We had floods in our streets in the San Fernando Valley, and John will verify the Santa Clarita Valley did, too. Water did sometimes even flow over our curbs, up over our lawns and once, right up next to our porches. Back then, my big sis had the very same model car that Maxwell Smart drove in the first episode of “Get Smart.” A Sunbeam convertible, from England. Complete with (then) bad English wiring and electronics. Still, it was a rag-top, a “sports car” and Barbara loved it and it was a joy to drive on a sunny day and less so on rainy days, but one rainy day, after we’d been pent-up, rain-housebound too long, we decided to break out and Barb drove herself and me to the Topanga Mall in the torrential Southern California rains in that little Sunbeam. Picture, rain water rising up through the floor boards, so much so that your shoes and socks got wet from inside the car. Picture throwing a wake big enough for wake boarders to have a field day as we trudged southbound on Topanga Boulevard through the flooded West San Fernando Valley. Those kinds of memories don’t happen anymore around these parts and it isn’t just because of improved infrastructure. When’s the last time you remembered California for having super-efficient infrastructure? The Time Ranger will recall a time when driving over the Interstate 5 pass into Sylmar, one viewed an expansive forest of evergreen trees adorning the north-facing hills. Hundreds, no – thousands of Conifers covered the seasonal green hills, greeting commuters with a pastoral emerald landscape as they passed to and from our beloved Santa Clarita Valley. And there were seasonal waterfalls along Lake Hughes Road as one drove up to what used to be Lake Hughes and Elizabeth Lake. You can still see the coloration along the hillsides where water once poured down the steep mountainside every rainy season. Indeed, there once was a proper Lake Elizabeth, complete with small boats — and I know, because I once built a home with a lake view there. Not so much, now. Today it’s Elizabeth Ditch. My mom and dad owned a 1956 Ford Custom. On Sundays, they’d drop my youthful sister AJ and I off to church at Chapel of the Cross Lutheran on Sepulveda Boulevard. Yeah, we were often just dropped off. SAD. But mom also came somewhat frequently, and if you can believe it, the practice then was for women to wear either scarves or hats to “properly cover themselves.” That’s a digression – but boy things have changed in so many ways. Perhaps it would please the gods and we’d get more rain if our women folk returned to covering their heads? Dad didn’t show up at church much, but I sure can recall dozens of times he’d drive us there in the heavy rains and the old Ford would stall out because the rain water would splash up and the distributor would foul. If you don’t know what a “distributor” is, then none of this column makes much sense. We don’t have distributors anymore. And, until this most recent year, it seemed we didn’t have rain anymore, either. Let’s hope this recent winter is a pattern-breaker. Let’s hope the past 20-30 years of mostly drought is a fluke and we’re returning to the norm. Let’s hope there’s no such thing as man-made climate change or global warming or whatever name it is you can accept for what’s happening. Let’s hope that those whales that recently beached up and died with 46 pounds of plastic debris in their guts suffered a death nothing to do with all that plastic in their guts. And let’s hope that the trillions of barrels of oil and trillions of tons of coal we’ve been burning at rates unimaginable only from back when I was a kid has nothing to do with our hotter oceans, wilder weather, weird hurricanes, glaciers melting, epic floods, dying bugs, bees, and animals… and scientists fretting and warning about what is coming next – but still 35 percent of the country think’s it’s all fake. Maybe all the fretting and worrying is leftist, anti-capitalist Russian-influenced fake-news propaganda. Like we’re told to believe all news is nowadays. But the Time Ranger and I remember when Sepulveda Boulevard would become a river. When once it snowed so deeply on the SCV pass that my buddy Bruce and I ditched school at Monroe High and got stuck on the 5 overpass in my VW Beetle and threw snowballs all morning long before the Highway Patrol forced us to go back into the Valley because everything was snowed in hard. When as a kid we would make little boats and float them down the gutters in our street into the next streets, way down to Devonshire, because there was so much water rushing through. And when my big sis and I would get stranded because her fun but unreliable Sunbeam sports car couldn’t handle 10 inches of rain in our flooded streets. Can you imagine any of this, right here, right now? And that’s the problem. We don’t know what we don’t remember and what we don’t want to believe. So, far too many believe biases and just keep on hoping and praying for more rain. 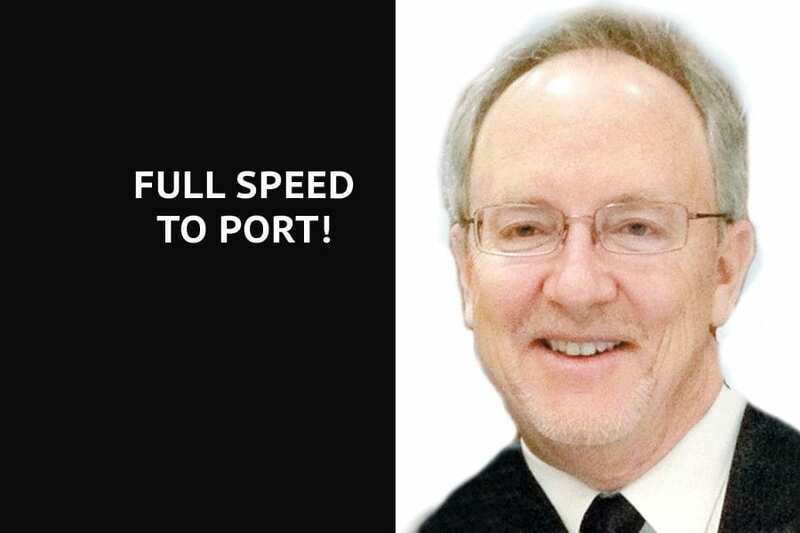 Gary Horton’s “Full Speed to Port!” has appeared in The Signal since 2006.